We hoped to place in top 10 of sister/sister teams. Unfortunately, we came in 25th place. I made shirts by www.customink.com with my sister's design. 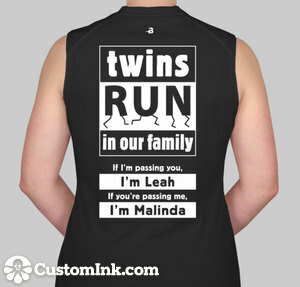 We "ran" into so many twins because of our shirt! Thanks to all the twins we met! You two are adorable... I can say that because twins run in my family... I am the Mom to my very own set. You both did amazing..WHOA Leah is like lighting, very impressive job by both of you. Love the finish photos!